Consider this visual: an old woman in a village in coastal Orissa is looking far ahead at a silvery sheet of water -- the Bay of Bengal -- trying to figure out where her home was. This is actually a scene from Climate's First Orphans, one of the four short films on the impact of climate change and global warming in India produced by the British High Commission. 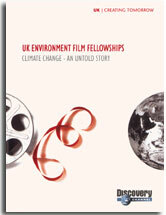 The three other films funded by the uk Environment Film Fellowships 2005 are The Weeping Apple Tree, A Green Agony and A degree of concern. The films cover the fundamentals of climate science by interweaving research inputs with human narratives. Climate's First Orphans Set in coastal Orissa, Nila Madhab's Climate's First Orphans talks about homeless villagers of Kendrapada district, where several villages have been wiped out by rising sea levels. The film refers to cyclones as a "dress rehearsal" to global warming-induced climate change. In Satabhaya, a cluster of seven villages in Kendrapada district, only two remain -- on the brink of extinction. The Bay of Bengal has consumed the other five. A visual of a 30-year-old tube well serves as a stark example. It used to be in the centre of one of the surviving villages, but now is at the edge, very close to the sea. Agriculture has been destroyed as seawater intrusion hasmade land saline. The film presents a nuanced approach on ways climate change affect people. Its researchers say the Bay of Bengal is heating up and rising by 1 mm every year -- this means 172 hectares (ha) of submergence. The Weeping Apple Tree A lone fungus-coated apple tree stands amidst a field of plum trees in Hurla village in Kullu, Himachal Pradesh -- once a hub of apple production. Warmer temperatures have caused a decline in production. Apple cultivation has shifted to higher altitudes. Peaches, plums and cauliflowers have replaced apples in the lower regions. The film, directed by Vijay S Jodha, says apples require six inches of snowfall, and scientists are worried where farmers will grow the fruits when higher altitudes get warmer. Meanwhile, the lone apple tree will either be chopped for firewood or just wither away. A Green Agony Geeta Singh's film explores the unique ecosystem of Sunderbans, the largest mangrove delta in the world. With 7,689 ha of forest land submerged, monsoons delayed, and increased salinity levels in river and underground aquifers, the inhabitants of the area have been transformed into ecological refugees with no place to go to. Mangroves and the sundari tree are disappearing. So are islands. Bhangaduari and Ghoramara in western Sunderbans are being submerged at the rate of 20 ha a year. Of 1,000 families, only 400 remain in Ghoramara. Other islands, such as Lohachara, Bedford and Kabasgadi, have been submerged completely. It is estimated that by 2060, more than 200 sq km of mangroves will get submerged along with all of Ghoramara. Along coastal India, about one million people will be at risk. A degree of concern Set against the Himalaya in Ladakh, Syed Fayaz's film portrays the implications of climate change on glaciers. It says: "A glacier is on your left, a glacier is on your right. The whiter the glacier, the better it is for us." The camera then pans to areas with brown patches, where rocks start to show -- a negative sign. It also showcases the work of Chewang Norphel (see 'Fashioned from glacier melt,' Down To Earth, September 15, 2004), an engineer who makes artificial glaciers that supplies water to five villages. Glaciers are retreating by 50 metres every year endangering India's major rivers, which depend on water from them during the summers. While the average temperature in the area was -15.4 c in 2002, it went up to -10.4 c in 2004. It is estimated that by 2050, glaciers will be reduced to one-fifth of their current size due to a 1c rise in temperature. The film warns: "Some are aware, some ignorant, some concerned and some indifferent. A 1c rise will end that indifference". Overall, the films are intriguing and worth watching, especially for those who are oblivious of the impact of climate change.